Counterpath products several VoIP related products for both consumer and business usage. Clients may enjoy the simplicity and use of the X-Lite softphone. For those requiring more features for use in a business environment the Bria softphone may be an option. 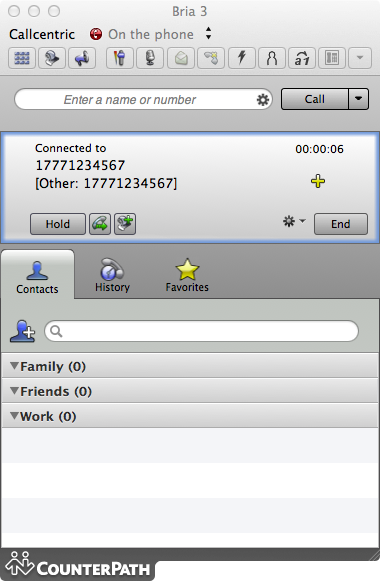 The Bria softphone is available for both desktop (Windows, OSX and Linux) and mobile platforms (Android and iPhone/iPad) as of this time. Note that this is a paid product and pricing can be found on the Counterpath website. 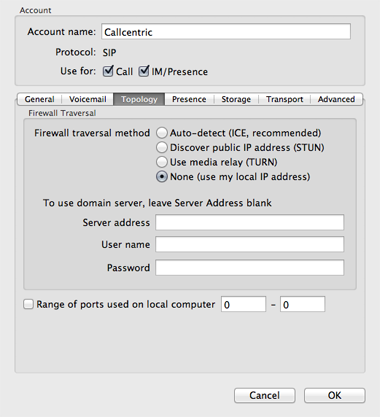 This guide is based on Bria 3 version 3.2.2 build 63091 for Mac OSX. Similar versions should look the same. You will need a licensed version of Bria. If your version is not licensed then you will not be able to follow this guide. We recommend that you read each step through in its entirety before performing the action indicated in the step. Launch Bria using the shortcut either on your desktop, your start/applications menu, or your applications folder. * If this is your first time launching Bria please choose the No login required option and enter your license. We will now need to access the account configuration menu. For OSX you can click on the Bria menu at the top left of the screen. 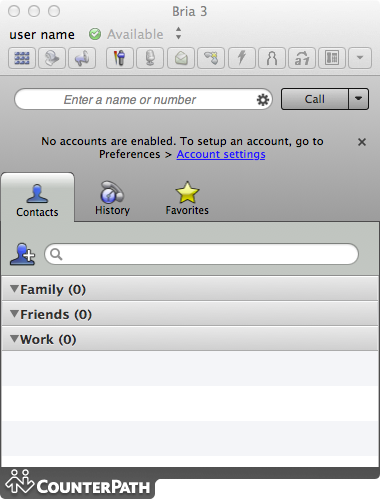 Then click on Preferences and Accounts to gain access to the accounts window. For windows please click on the Softphone menu at the top left of the application. Then click on Account Settings to enter the account configuration dialog. After you have accessed the account configuration interface you will see a window with tabs across the top. Click on the plus button at the bottom of the Accounts tab to add a New SIP account. Please use the information below to configure your Callcentric account. 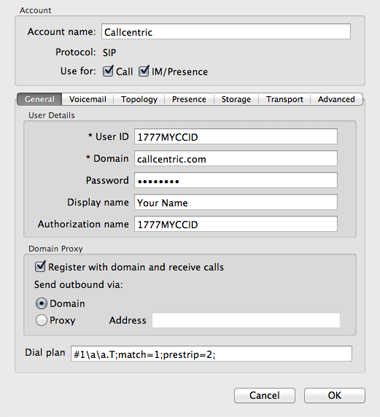 Authorization name: This is either the default extension 1777MYCCID OR 1777MYCCIDEXT, where 1777MYCCID is the 1777 number assigned to you by Callcentric and EXT is the three digit extension you are trying to register this UA to. 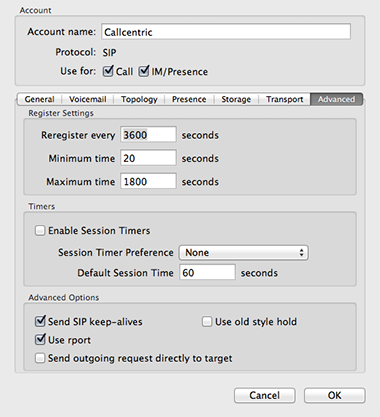 Here we will configure options related to your network. For users who wish to use video this may be possible however both calling ends MUST support the same codec. In other words please make sure that at least H263 is enabled in your video codecs configuration.